SMART. FRESH. FUNNY. Comedy for EVERYONE! This fresh young comic has entertained audiences throughout the country. Whether delivering his timely, refreshing brand of stand-up, hosting an event, or performing in plays Cletus is sure to leave audiences laughing nonstop. “The environment that I was raised in gave me a unique perspective of life. We couldn’t afford a therapist so laughter became a REAL medicine.” Growing up in a single parent household Cletus developed a close, personal bond with his mother and other family members that can be heard as he sprinkles bits and pieces of his everyday life into his routine. No topic is safe from his No Filter comedy. Cletus’ unique and comedic delivery has provided him the opportunity to entertain audiences throughout the country and on national television. 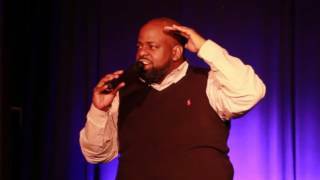 In 2014 Cletus Kassady was named winner of the McDonald’s Gospel Fest comedy category. He has entertained on stages nationwide from New York City to Atlanta to Virginia and numerous corporate groups and charities using both his wit as a comic and his ability as an actor as his calling card. He is a favorite on TV One’s News One with Roland Martin during the Wildin’ Out Wednesday segment having been asked to return several times. In addition to appearances, Cletus has dazzled audiences as an emcee for awards shows, celebrations and festivals; opening for many nationally known artists in Hip-hop, Gospel, R&B Music and comedy such as Marvin Sapp, Ricky Dillard, Byron Cage, Akintunde, John Gray, Mike Epps and D.L. Hughley.